This is a blog about how freedom came for the slaves during the American Civil War, but now and then I indulge in other unrelated subject matter. Such as my post last October poking fun at nervousness in certain quarters of the North in Fall 1861 about British troops in Canada. Today, I intend to indulge in another off-topic post. February 14, 2012 is the 100th anniversary of Arizona statehood. Arizona became a state on February 14, 1912. I only have been a resident of Arizona for about a year-and-a-half, but my ties to the state go back a long ways. My great-aunt Rose (my father’s aunt) came to Arizona before World War II, when as a nurse she contracted tuberculosis. With the help of the state’s dry climate she lived long enough to see a cure for the disease and to outlive the rest of her ten brothers and sisters. She was joined eventually by her sister, Mary, and when I was a child, our family would sometimes cross the desert from California to visit them. My maternal grandparents were Canadian snowbirds that found a roost during the winter in a trailer park in Mesa, not far from my great aunts’ cluttered Phoenix apartment. So a visit to see my great aunts was usually timed so we could see my mother’s parents as well. After a couple of false starts trying to retire in California, my parents finally settled in Mesa, where my mother still lives (my father died a few years ago). Consequently, I have been in and out of the state for years, enough that it was a long a second home to me before finally becoming my first. But enough of my family’s Arizona history. What a lot of people, even state residents are unaware of, is Arizona’s Confederate roots. At the start of the Civil War, what is today the states of Arizona and New Mexico, were part of New Mexico Territory. Although still quite isolated and rugged, by 1860, the territory was splitting apart on sectional lines not unlike the rest of the United States. The northern part of New Mexico Territory tended to be loyal to the Union and looked for leadership to the official territorial capital at Santa Fe. However, residents of the southern part of the territory abutting Mexico, some of them from the American South and alienated by federal neglect, hoped to join the Confederacy. On March 16, 1861, they met at Mesilla and voted to secede from the Union, establishing themselves as Arizona Territory. While the nascent Confederate government greeted the news favorably, as it had ambitions to achieve a continental nation from the Atlantic to Pacific, Jefferson Davis and the Confederate Congress had more pressing matters, but finally on February 14, 1862, admitted Arizona as a Confederate territory. Confederate Arizona’s existence was short-lived. Union forces defeated an attempt by Confederate troops from Texas to seize New Mexico Territory in Spring 1862 and by that summer the government of Confederate Arizona was forced to flee to Texas where it effectively ceased to exist. 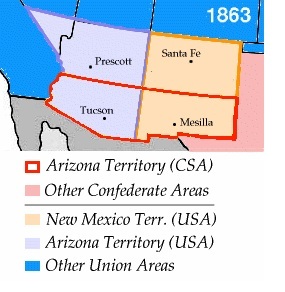 When the U.S. Congress established its own version of Arizona Territory in 1866, it deliberately drew the boundary between it and the rump New Mexico Territory running north to south, so to split the old New Mexico Territory east and west instead north and south such as has been the case during the Civil War (see the map above). However, the Confederates got the last laugh, so to speak. When it selected the date for Arizona statehood, Congress, now with plenty of Southerners in it (which hadn’t been the case in 1866), chose the date of February 14, 1912 for Arizona to become the 48th state, fifty years to the date that Arizona had been accepted into the Confederacy. Another example of the South losing the war, but winning the peace. This puts me in mind of a gentleman from Arizona who once engaged me in some heated discussions in the Civil War Forum. He was one of those angry, League of the South types who claimed both Confederate and Apache heritage. Somehow he had it in his head that the Apache were brothers in arms with Confederates in the Southwest, trying to throw off the yolk of Yankee tyranny. It was a fantasy — legions of Apache warriors joining the ranks of Johnny Rebs — of which he could not be disabused. He has hard pressed to explain passages I was quoting him from the O.R. — missives from John Baylor, Confederate Governor of Arizona, to Richmond, recommending the best way to deal with the Apache menace. Baylor figured the adult Apache could not be rehabilitated. His idea was to kill all adult men, women and older children among the Apache, and move the small children into American schools where, in a generation, they could be assimilated. That’s another example of an enduring mythology about the Confederacy. Even though the highest Confederate authority in the region was promoting the near-extermination of Apaches, this modern day neo-Confederate is posting treatises on the internet about the mutual respect shared by all the Yankee-hating heroes in the Territories. Hi David. Thanks for the story. It brings to mind the fact a big reason the small Anglo population in southern New Mexico Territory became alienated from the Union by 1861 was they did not think the U.S. government was doing enough to eliminate the Apache threat. They hoped the Confederacy would do more. The Arizona story is not unrelated to the larger purposes of your blog. The “secession” of Arizona was not declared by the residents of the southern part of Az, most of whom were Latino, but by a few hundred transplanted Southerners. The declaration, along with the Confederate invasion of the territory, were part of a longer tradition of white Southerners using military force to extend slavery into Latino lands from Nicaragua to New Mexico. What Professor Shaffer and David talked about is treated in today’s NYT Disunion post. Fascinating reading. David shows what is one of the highlights of the Disunion article: racial extermination. Of course, this wasn’t something that one section of white America had a monopoly on. Pretty good history lesson on the southwest. But it doesn’t sound like the confederates got the last laugh? Your explanation indicates that the territroy was divided north to south to make states that would dilute the southern influence. If true, then the rest of the country had the last laugh on the southerners. In return, southerners joined the union on the day they offically decided to fight for slavery. That’s not funny – that’s sad. It says a lot more about the southern culture of the time of Arizona’s statehood. I don’t read the date of Arizona’s admission to the Union as the Confederates getting the last laugh. In fact, just the opposite. Congress was figuratively rubbing Confederate sympathizers’ faces in the fact that the Confederacy’s attempted theft of that territory had been utterly overthrown by the Union. After all, February 14, 1912 is associated totally with Arizona becoming a state of the U.S. Nobody now thinks of the Confederacy in connection with that date.